The most familiar Catholic prayer that we’ve been taught from young is the Pater Noster, the very prayer our Lord taught His disciples. Right after addressing God as Father and affirming the holiness of His name, we make this petition: “Thy kingdom come, thy will be done, on earth as it is in heaven” (Matt 6:10). I strongly believe that few truly understand the intent and gravity of this simple petition. It pleads with God to act, to enter into our circumstances and to bring about His reign. It hopes for the day when God would end war, bring good news to the poor, bind the brokenhearted, proclaim liberty to captives, bring justice to the oppressed, comfort the mourning, create a new heaven and a new earth, and gather all the nations to worship Him. But the Lord’s Prayer guides us through a world where ideal seems different from reality, where heaven and earth can seem really far apart. Wars are still fought. The poor still experience injustice. The broken-hearted still suffer. People are still captive to sin, death, the devil. We live in a world that either sees no need for God or is callously indifferent to His existence. 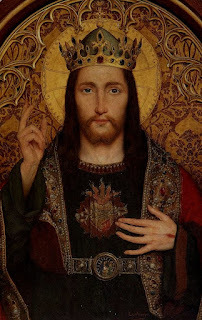 But, despite our everyday experiences, the Church continues to proclaim as she did from the very beginning until the very end of time, that our Lord is King. She continues to proclaim confidently that our Lord Jesus Christ reigns, and because He reigns as King of the Universe, death is a defeated foe, sin is being subdued, the hearts of the broken-hearted are being bound up, the poor are hearing the good news, justice is coming to the oppressed, communities and individuals who mourn are being comforted, the new heavens and new earth are being re-created. Of course, in the midst of gloom, it is hard to perceive any of this. Is God’s Kingdom still an unfulfilled and distant dream? Well, today’s gospel reminds us that His Kingdom is not of this world and it can only be perceived by those who do not belong to this world. By replying with another question, Jesus is not refusing to answer Pilate: He wishes to make it quite clear, as He has always done, that His mission is a spiritual one. And really, Pilate’s was not an easy question to answer, because, it failed to fit into the categories of our Lord’s interrogators. To a Gentile, a king of the Jews meant, simply a rebel and political subverter of the Empire; whereas, to a Jewish nationalist, the King-Messiah was a politico-religious liberator who would obtain their freedom from Rome. They had that much in common. But the true character of Christ’s messiahship completely transcends both these categories. 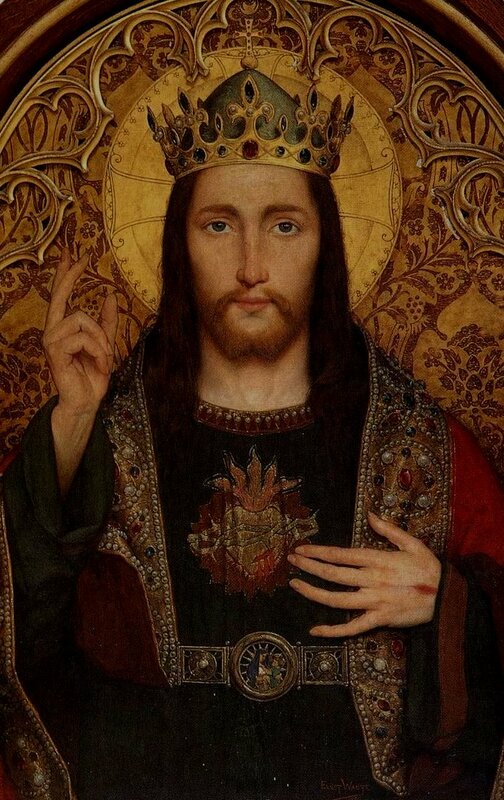 Then Pilate proceeded to ask Him the third and final question, “So you are a king then?” To which our Lord answered, “It is you who say it … Yes, I am a king. I was born for this, I came into the world for this: to bear witness to the truth; and all who are on the side of truth listen to my voice.” The word “truth” refers to something more than just the veracity of Jesus’ testimony. It is used 25 times in John’s Gospel to refer to divine revelation. Jesus Himself declares, “I am the truth”, because He is the revelation of the Father. Jesus bears witness to the truth that He is from God the Father, sent to serve and save mankind, by making God known in Jesus’ own person, by His words and actions and by gathering about Him those who freely respond. His greatest act of witness to the Truth is about to be fulfilled on the Cross. By His death and resurrection, our Lord shows that the accusations laid against Him were false: it was He who was telling the truth, not His judges and accusers, and God confirms the truth of Jesus–the truth of His words, of His deeds and of His revelation–by the singular miracle of His resurrection. To men, Christ’s kingship may seem paradoxical; in fact, it is the supreme paradox: He dies, yet He lives forever. He is defeated and is crucified, yet He is victorious. So, why does God continue to tolerate wicked people and their wickedness if indeed the Kingdom is upon us? Now, God delays judgment to give people time. Our Lord is not indifferent to our suffering nor is He late. On the contrary, He is patient, very patient. As St Peter writes, “The Lord is not slow to fulfill his promise as some count slowness, but is patient toward you, not wishing that any should perish, but that all should reach repentance” (2 Peter 3:9).But let us not take His patience for granted. At Christ’s return He will judge sin, death, the devil, and the people who choose to align themselves with evil. For now, we wait and hope. We recognise that we will not find a solution to all our troubles in our own human resources. We must look for the answer in the Kingdom of Christ. Here is our hope against all those experiences of death, suffering and evil. For this Christ was born, and for this Christ came into the world, to bear witness to the truth. Everyone who belongs to the truth listens to His voice.